Every round, you have 30 seconds to pick a card. Random Battle matches you against opponents anywhere in the world. Follow the arrows in the element circle chart to see which element beats other elements. element types, you win the battle. When cards have the same element. Then strength number determines the winner. When cards have the same element. Then strengfh number determines the winner. You are a Mighty Smighty! 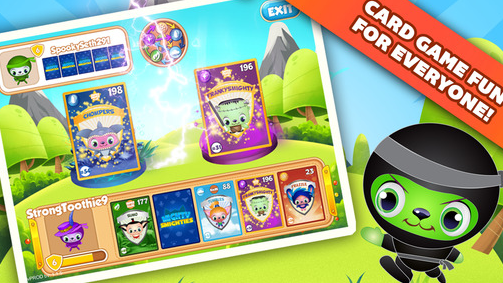 Each time you win, you spin to collect a special prize! You earn Silver Tokens and Smighty Gold the more you play. You can buy cool stuff in the Shop! You can get full lives in Mighty Smighties app at anytime. You can get this cheat by changing your phone's time setting. Close your Mighty Smighties app by either restarting your phone or by killing it on your task manager. Open Mighty Smighties app and you will get your full Lives. Open Mighty Smighties app but do not play a single game. Open Mighty Smighties app just to make sure that there is no problem.